By Admin in New Events & Resources on March 22, 2019 . In just about a week, our economical registration program will run out and the special rate which you have on rooms will expire. SO—the key thing to do is REGISTER NOW with the San Marcos Resort in Chandler Arizona (+1 480-812-0900) for your rooms. You should also go to our Seven Ray Website—www.sevenray.org—and register for the Pre-Conference and Main Conference—whatever is possible for you. But do hurry, as the inexpensive room rates are really a significant reduction from the usual, and you will want to take advantage of this savings. The THEME of our CONFERENCE is an important one, AND, we get a chance to dive deeply into the mysteries of the Divine Mind ruled by the “acute energy of divine mental perception” which, according to the Tibetan, admits the consciousness of the initiate into the “secrets of the Mind of God”. I, personally, have been looking forward to sharing some of my deeper speculations on the nature of REALITY and the NATURE OF BEING—a subject which has fascinated me for years. So, friends, do take the plunge, save some money on your room-rate, and register right away. AND take an exciting journey into the DIVINE MIND. The Spiritual Hierarchy of our planet in its cooperation with Humanity works largely through events-through positively oriented gatherings of people who, together, want to see a better more spiritual world emerge from Humanity’s presently confused and glamoured condition. 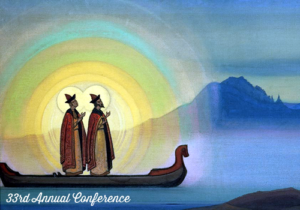 We have always felt that the annual USR-SRI Conferences offer just such an event – opportunities for collaboration with that Great Society of Organized and Illumined Minds-the Masters of the Wisdom, the Hierarchy – and this year’s Conference is no exception. Why do I think a focus upon the Third Ray of Creative Intelligence (of Abstract Mind and Activity) is so important? Simply because the personality of our Planetary Logos is on the third ray, while His Soul is upon the second. The human personality, generically, expresses the very same rays. So many problems on our planet exist precisely because it is difficult to bring these two rays together in mutual cooperation, and yet the task is urgent. Perhaps a cosmic misalignment (of which we know little) in the Great Bear, or perhaps misalignments far beyond are the ultimate causes of difficulties on Earth, but, at least, we do know there are, indeed, difficulties causing significant problems for Humanity. Love and Intelligence are not aligning as they should and the integration of the soul and personality nature of our Planetary Logos (and the soul and personality nature of Humanity) is not yet occurring as it should. We, as students of the Ageless Wisdom, can do something about this and our help is needed. Your help is needed! A conference like ours can help bring these two rays into harmonious cooperation in service of the Divine Plan, and we should consider the importance of the opportunity offered to us. We know that all of us are seeking a deeper connection between the spiritual part of our nature and the more material/personal side. It is not easy, is it? The great Initiate (and now Master) Paul, gave us a testimony to His struggle to do this very thing-bring soul and personality together. This spiritual task takes years to fulfill (perhaps, even lifetimes) once one discovers the lack of their integrity between soul and personality. Our Conference, especially when it focuses on the Third Ray, gives the opportunity to blend the intelligent pursuits of Humanity with the Love and Wisdom poured forth from Hierarchy-so very necessary on our planet and in the lives of all of us who care about the illumination and manifestation of the Divine Plan. The Divine Plan MUST manifest, and it is up to people like ourselves (many of us quite serious students and practitioners of the Ageless Wisdom) to help! That is why I would like to see as many of you as can attend the Conference in person, to be there with us-not only the main Conference beginning on May 7th, 2019, but the intensively esoteric Pre-Conference beginning on April 30th with the Ceremonial Workshop, the Esoteric Astrology Seminar and the Advancing Seven Ray Seminar. In these Pre-Conference offerings, we go into many of the deeper aspects of the Teaching for true students of Spiritual Esotericism. During the Main Conference we synthesize it all making our understanding as widely and practically available as possible. The keynotes of the Pre-Conference and Main Conference have different colorations, but together they produce a beautiful and powerful whole which uplifts all attendees as well as the many we reach over the Internet and through our daily Global Meditations during Conference. So, Friend, do make every effort to be with us in person. You will benefit; the Conference attendees will benefit from your presence; and the hundreds we can reach through our outreach — streaming, broadcasting and video programs — will also be inspired. Many take the USR/SRI Conference as their point of spiritual/practical inspiration for the year. I understand why they do so. Conferences are inspiring and they stimulate many ideas about how we can serve more effectively in cooperation with the Spiritual Hierarchy and the Divine Plan. Please go to www.sevenray.org and register to attend, for either the Main Conference or Pre-Conference, or ideally for both! My colleagues and I, and your old friends from Conferences past-if you have been with us before-will be most happy to greet you. Or, this may be your first time at one of our Conferences, but whether this is your first Conference or whether you are a veteran of these hierarchical opportunities, we will be delighted to see you and work with you. Hoping you can join us for what looks like a great opportunity to blend Love and Intelligence. PS: We are working on a plan to bring Alice Bailey’s grandson to the Conference. He has many things to share which no doubt will be of keen interest to all of us.